The new flagship of the ROG monitor fleet, the Swift PG348Q expands your scope, allowing faster target acquisition while increasing immersive visuals with a 34-inch 3440×1440 curved ultra-wide IPS panel. Bristling with advanced display tech, the newest Swift PG348Q also features NVIDIA® G-SYNC™ technology for smooth and seamless gameplay, while simultaneously sporting a 100Hz refresh rate, eliminating roadblocks between your skill and victory. 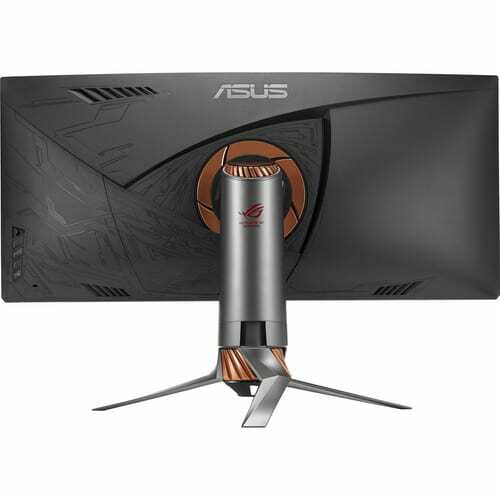 Add the armored design and unique ASUS features and you’re looking at a monitor that is truly unrivaled. ROG Swift PG348Q has already received critical acclaim – winning the 2016 CES Innovation Award. 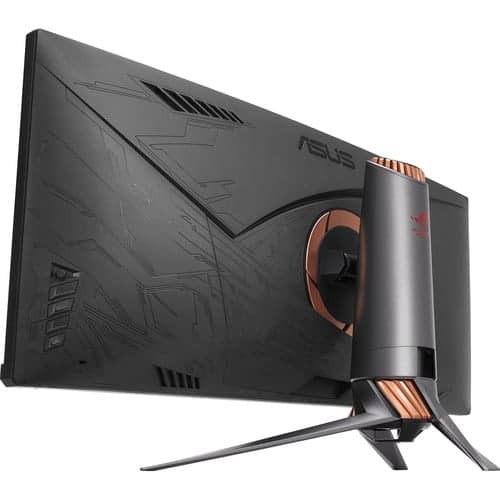 It has a revolutionary design finished in ROG’s new Armor Titanium and Plasma Copper color scheme, and has built-in ROG light effects on its stand to add ambience to your gaming set-up. 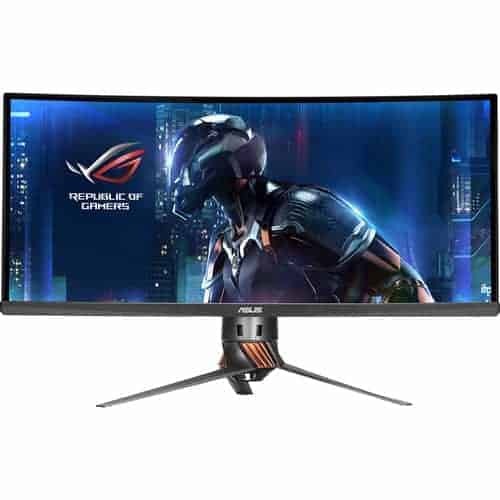 The ROG Swift PG348Q gaming monitor features a 34-inch 3440 x 1440 ultra-wide QHD panel with pixel density of 109 pixels per inch (PPI) so you enjoy greater detail when playing games or watching movies. 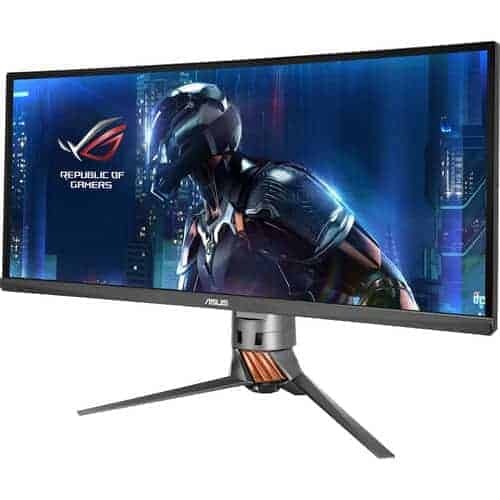 Its ultra-wide 21:9 aspect panel gives you 35% more onscreen desktop space than a WQHD display, so there’s even more room for your various application windows when it’s time to get work done. ROG Swift PG348Q takes realism up a notch, giving you visuals with great textures, so even your in-game terrain maps boast impressive levels of detail. You’re treated to vibrant lifelike images thanks to a 100% sRGB color gamut, a 1,000:1 contrast ratio, and 10-bit color for 1.07 billion distinct hues. The IPS panel gives you wide viewing angles for minimal distortion and color shift, even when you’re viewing it from extreme positions. ROG Swift PG348Q has a Turbo Key that lets you toggle refresh rates on the fly without having to access the graphics control panel. You can seamlessly switch from 60Hz to 100Hz in the middle of the game, allowing you to overclock the display’s refresh rate for the smoothest gameplay ever. Recommended for games which are much slower in pace, such as MOBA games, can be played just fine with lower pace. Recommended For games which have a lot of fast motion and hectic action, especially first person shooters. NVIDIA® G-SYNC™ display technology delivers the smoothest, fastest, and most breathtaking gaming imaginable by eliminating screen tearing, and minimizing display stutter and input lag. ROG Swift PG348Q gives you smooth and seamless lag-free visuals when playing the latest fast-paced first-person shooters, sports, and action-adventure titles. ASUS GameVisual Technology gives you six display mode presets to optimize visuals for different types of content. This unique feature can be easily accessed through a 5-way joystick or the On Screen Display (OSD) settings menu. Ideal settings for viewing photos and graphics online. Provides a greater brightness range and introduces more contrast gradations. It tweaks color saturation for greens and blues, making it ideal for viewing photos and videos that depict scenery. Reduces input lag, making it ideal for racing games when G-SYNC™ is on. Enhances contrast and color saturation for lively, vivid visuals — ideal for viewing movies. Enhances color saturation and contrast sharpness to give you better, brighter colors and detailed visuals for real-time strategy (RTS) or RPG games. High contrast settings enhance the visibility even in dark scenes to clearly see your enemies. Designed for those who want the ultimate battlestation, the PG348Q features frameless design, nearly seamless for multi-display setups, for an even greater degree of immersion. 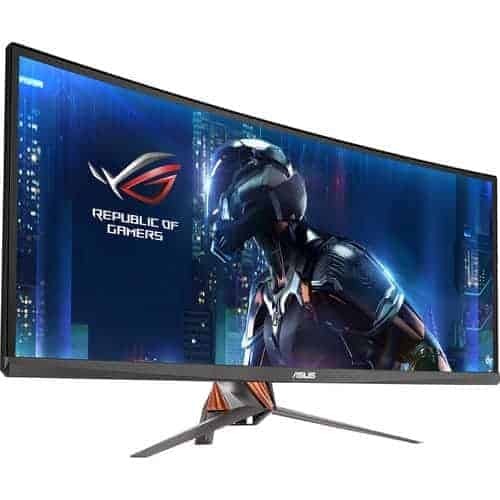 ROG Swift PG348Q has a wide selection of connectivity options including DisplayPort 1.2 and HDMI. There are also four USB 3.0 ports for your mouse and keyboard, they can even charge your mobile devices while gaming. ROG Swift PG348Q comes with the ASUS Ultra-low Blue Light filters to protect you from harmful blue light. You can easily access and select four different filter settings onscreen through the 5-way joystick. ROG Swift PG348Q reduces flicker to give you a comfortable gaming experience. This minimizes instances of eyestrain and other damaging effects when you’re embroiled in long, drawn-out gaming sessions. ROG Swift PG348Q is specially designed for marathon gaming sessions. It has an ergonomically-designed stand with swivel, tilt, and height adjustment so you can always find the ideal viewing position. ROG Swift PG348Q features a custom heatsink that’s twice the size of those found in other monitors to ensure it stays cool during marathon gaming sessions. Cooling is also aided by a Smart Air Vent design that uses convection currents to generate airflow within the monitor. This fanless cooling system ensures that ROG Swift PG348Q operates silently and stays maintenance-free.